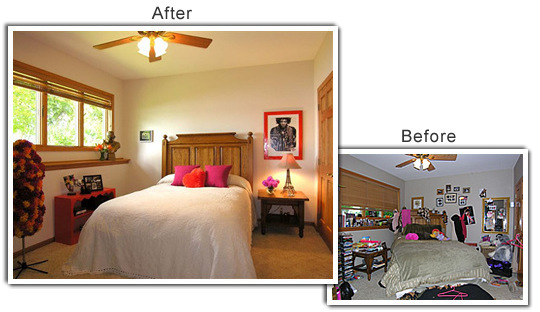 The project: A teenager's bedroom in Burnsville. What worked: Well proportioned, newer neutral carpeting, a full-length display ledge and a large built-in closet. What didn't: Bad colors and too much clutter. Moving can be as difficult for a child as it is for a parent. It's even worse if you plan to relocate them out of the area, leaving friends and changing schools. While most potential buyers are more forgiving of a child's room than any other room of the house, that doesn't mean you can leave it looking like a cyclone just blew through. "Getting a teenager to clean up their room can be tough. Getting them to help stage their room for market can be even tougher," said Lori Matzke of Centerstagehome.com. "I never recommend you completely remove your child's personality from the space. You don't want them to feel displaced in their own home," she said. "But working with them to help redefine their style can make them feel more grown up and more like part of the solution rather than part of the problem." Here's what Matzke did to turn this mini disaster into something more presentable. Matzke helped box up two-thirds of the closet contents. A larger laundry hamper, plastic storage bins and additional shelving add space for the essentials. Laundry was sorted and clutter from the window ledge was boxed. Matzke painted the walls a pale shade of warm vanilla white in a flat finish after removing pictures and posters, spackling nail holes and removing leftover adhesive. Since the room is on the lower-level, bright walls will keep the space from looking too dark and dreary for late-afternoon or evening showings. If the walls of a secondary room are painted in an inoffensive color and are in good condition, cleaning them, filling the nail holes with spackle and retouching with leftover paint are usually enough to keep you from repainting the entire room. The vintage dress form, which had been draped with excess clothing, became a fun accent by attaching colorful silk flowers with a hot-glue gun with help from the teen. A favorite poster was inexpensively framed and the frame was painted with the same glossy orange paint as the bookcase. An unfinished plaster bust was painted in an antique brass finish and fitted with a pair of cool black sunglasses for added sass. Candid snapshots of family and friends were displayed on a decorative metal stand. Fresh flowers add extra pop. Matzke positioned the bed to make the room feel larger and to give potential buyers a full view of the windows and outside view. Matzke bought a new chenille bedspread for $50 and mixed and matched new and existing pillows for accents. It's easier to keep a full-length bedspread neat and tidy than it is to fuss with a bed skirt and comforter every morning. A bedside nightstand was accessorized with an Eiffel Tower lamp for extra lighting. A bookcase from the garage was painted in the teen's favorite color and placed under the windows to store videos and CDs. "We wanted to keep the space organized, but we also wanted to give it enough funk to keep the current occupant inspired," said Matzke. "Just don't look under the bed!"